Over the past several years I've posted many examples of collaborative learning in my history classrooms grades 8-10. I've also spoken about the #gallagherhistory model at various conferences around the country and right here in Massachusetts. The part that gets most students' and educators' attention is that I do not give tests. Ever. Lecture is also never a part of the student learning experience. I invariably get follow up messages and emails filled with questions. Here are some of the most asked questions and their answers. 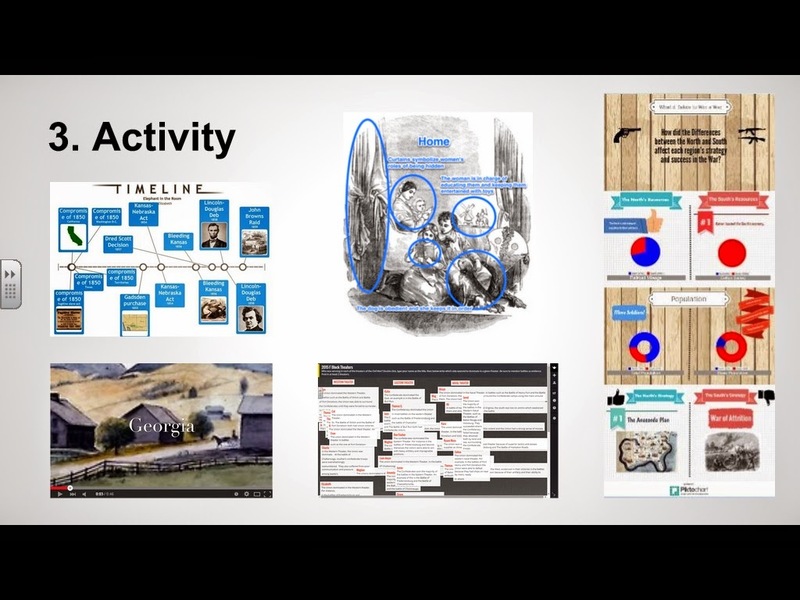 activities that promote analysis and discussion of evidence. Activity to help students dig into the evidence and develop their own understanding of the topic. These activities are usually collaborative in groups of 4-6 students. Record their understandings both with textual and visual annotated evidence using either Evernote or Google Drive. These notes are taken independently so students are developing their own understandings. Publish Learning on their own blogs. We use Blogger. Most students choose to make them public, but I provide all with a tutorial on how to make Blogger private in case they have concerns about publishing online. We go through this process weekly and most classes meet for 55 minutes about 4 times per week. Therefore, students are responsible for publishing at least weekly reflections on their learning from our class. Where do you get your content? The short answer is: research. I'll admit I was not a history major and my graduate degree is not in history either (I actually went to law school and have a J.D. ), but after teaching the subject for 13 years I've gotten pretty good at finding what I need. I'll never claim to know everything. In fact, most of my colleagues have more raw history content knowledge than I do. But the skill that I want my students to learn is how the find out what they want to know, not to memorize all of the information we cover in our class. I model this for them every time I put together a lesson. My go-to sites when I research are Reading Like a Historian, Gilder Lehrman, Library of Congress, and the Internet History Sourcebook to name a few. We use primary source documents, artifacts, and art. They study the opinions of historians based on scholarly works and also high quality documentaries from established sources like PBS and Ken Burns. I even use video overviews like Crash Course and Hip Hughes History. This makes some educators and even some education trainers uncomfortable. They want to know what content my district purchases. They want to know where the content model comes from so they can duplicate it and bring it to other classrooms. They want to know who taught me this method. The answers to those questions are not easy or quick. I learned from a lot of people. I found these sources through my own research, tips from my colleagues, and the awesome shares from educators I follow on social media like Twitter and Google+. How do you come up with your essential questions? It's been a process for me to develop the skills and mindset to write essential questions that will make the history really matter to my students. I don't always "nail it" either. One of the best resources for writing great essential questions as the basis for lessons is Grant Wiggins. For example, this is a great article about the important elements of a high quality essential questions that will promote meaningful learning. I can tell when I've really captured my students' attention. Here's a student blog post in which Kara, a sophomore, went above and beyond the required 19th century Women's Movement historical content and added statistics and commentary on the state of gender in today's American society. For me, the most important requirement for a good essential question is that it gets to the core of the way human beings treat one another. How do you manage reading and grading 120 blog posts (that's how many students I have) per week? The grading must be overwhelming! Yes, I do read all of my students' posts. Every word. It is some of the best and most rewarding reading I do. I encourage them to be honest about whether the learning experience was meaningful and if they have ideas for improving it in the future. Their posts have been affirming when we really come together and learn, and have been reflective when I know their ideas for improvement will make me a better teacher. A = Historians and experts in the field would be impressed. B = Teacher is impressed. C = Your parents (who love you unconditionally) would be satisfied. D & F = Generally not given. I don't accept posts that will not earn at least a C. We (student, teacher, parents) work together to make that happen. That's it. No fancy rubric. I do, however, provide guidelines for student blog posts that are always available on our class website. You'll notice that the guidelines are more about blog etiquette and good writing than about specific formatting. I want to give students freedom to write about history in a way that makes sense to them. By the time we hit February, most students exceed these requirements on a regular basis. As for feedback, I conference with each student 1-on-1 at least once within the first quarter of the school year. They get real personalized feedback on trends in their writing early on, and I get to know what really matters to them in their lives outside of history class. Beyond that, some students check in here and there for feedback on their writing. Others are satisfied with the general feedback I give to all classes on a regular basis. Sometimes they need a reminder to embed the media they created or to add captions to the media connecting it to the main idea. Other times they need a review of proper citations and adding hyperlinks to their posts. When all is said and done, I'm checking in with my students often about their writing without filling in complicated rubrics or commenting publicly with critical feedback on their blogs. The system works for us. This might not work for every teacher or every group of students. But I have taught heterogeneous groupings, honors level, and college prep level and most students have felt more invested in the content with this formula. I do think it is possible to teach this way across all subject areas and I truly believe the shift to this way of thinking about and interacting with our students is possible. Confidently, I can state that teaching this way has been the most rewarding change I've made in my professional life.